ASrid is a non-profit and sole organization for mutli-stakeholders in Rare and Intractable diseases. ASrid is committed to providing the valuable service/system for "connecting" and "creating" with/among them. J-RARE is mixed services with patient registry (PR) and personal health record (PHR) for NANBYO(Rare and Intractable Diseases) patients by themselves in Japan. 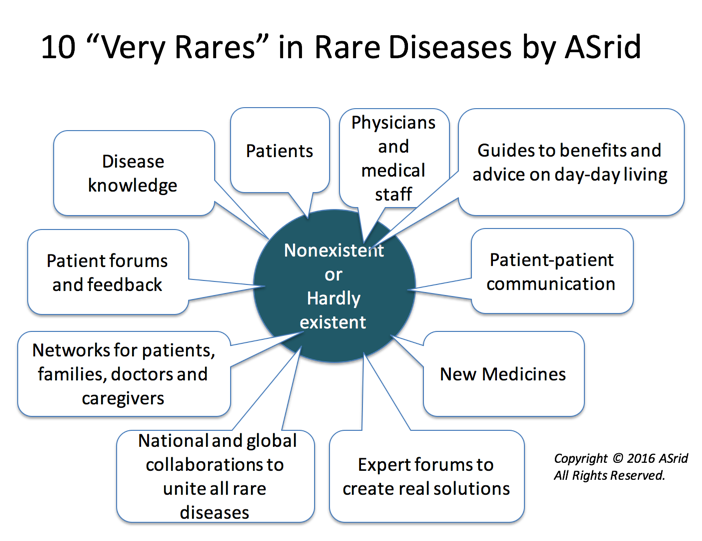 The goal of J-RARE.net is; 1) managing PHRs by rare and intractable diseases patients’ themselves to clarify their natural history, 2) bridging people who participate in studies both to reveal mechanism of pathogenesis and to develop drug for rare and intractable diseases. ODOD(Open Discussion for Orphan Drug Discovery) is a unique workshop for all stakeholders in Rare and Intractable diseases. ODOD has started since 2008 and participants are from academic, industry, patients/families, Policy implementation organization/government, venture investors, healthcare professional/Hospital, etc. ODOD has several key topics; presentation from researcher and patient/family, and general discussion. ODOD is hold by invitation only, because all attendees are able to express their opinions/feelings freely. Rare Disease Day takes place on the last day of February each year.The main objective of Rare Disease Day is to raise awareness amongst the general public and decision-makers about rare diseases and their impact on patients' lives.The campaign targets primarily the general public and also seeks to raise awareness amongst policy makers, public authorities, industry representatives, researchers, health professionals and anyone who has a genuine interest in rare diseases. The Secretariat office of RDD Japan has established in ASrid and promoted RDD events whole in Japan. In 2014, there were 21 RDD events from Hokkaido to Okinawa. JPA is a non-profit umbrella organization established in 2005. It focuses on rare and intractable diseases (NANBYO in Japanese) and has a membership of approximately 300,000 from 84 organizations, including individual patient groups and regional canters. All patient groups and regional canters are focusing to “NANBYO” area, which include with rare diseases, intractable diseases, and severe chronic diseases. JPA provides patient/family services and advocacy on public policies. The Pediatric NANBYO Support Network has created a network among pediatric NANBYO diseases’ patients, families and other persons involved. The network has also promoted various activities for enhancing QOL (quality of live) of children and families. KOINOBORI Associate Inc. is carrying out its activities concentrating on, among other rare diseases, mitochondrial disease. KOINOBORI is a nonprofit organization to bring accumulated knowledge and experience together for the development of new therapies to arrest progressions and pursue the recovery of lost functions in rare diseases. Established by medical doctors, venture investors, academic researchers, patient’s families, and scientists in 2009, it was registered in 2013. Founded in 1893, Jones Day is a US law firm with a history of more than 100 years. Since establishing the Tokyo office in 1989, we are providing comprehensive and efficient legal services to the various problems facing the business world in Japan and international markets. ASrid is located in Tokyo, Japan and has worked with/among multi-stakeholders related rare and intractable diseases field, as an Intermediate organization. ASrid has contracted the partnerships between JPA and The Pediatric NANBYO Support Network, respectively, especially about research promotion international relations and drug development area. ASrid has also collaborated with individual patient groups. Please give to empower the rare and intractable disease community, especially in Japan. If you have any questions about your donations, please contact us from here. Copyright © 2016 ASrid. All Rights Reserved.